Solvay Fire Department and Lakeside Fire District have added new rescue equipment to their emergency preparedness inventory. As recreational activity on Onondaga Lake continues to rise, the equipment, provided by Honeywell, will help the departments respond more effectively to watercraft incidents and emergencies in areas that were previously only accessible by foot. 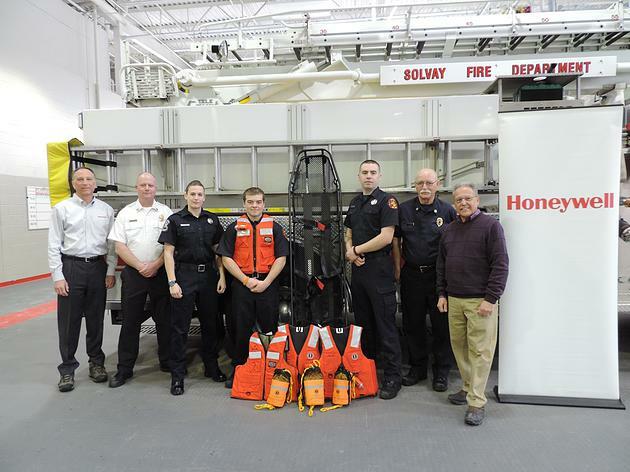 Solvay Fire Department received more than $5,000 worth of water rescue equipment, including personal flotation devices, buoys, lights, and stretchers. Pictured left to right are Honeywell Syracuse Program Director John McAuliffe, Chief of Fire Tom Spaeth, volunteer firefighter Heidi Armstrong, volunteer firefighter Jayson Kellogg, volunteer firefighter and EMT Steve VanOrden, volunteer firefighter Bob Zingaro, and Honeywell’s Advisor for Emergency Preparedness Peter Alberti. 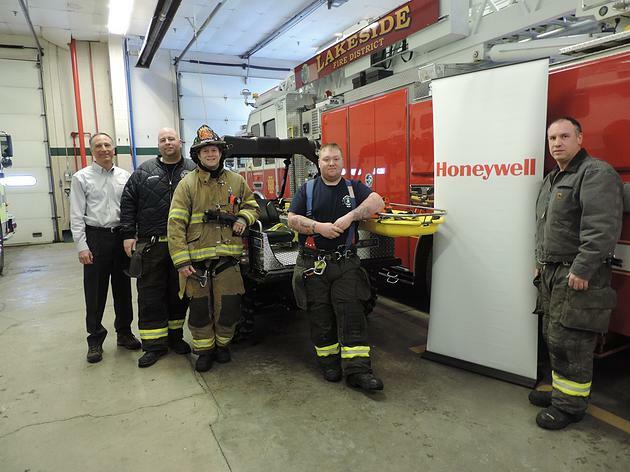 Honeywell also donated more than $4,000 worth of rescue equipment to Lakeside Fire District. The equipment is built to transport patients on off-road terrain. Pictured left to right are Honeywell Syracuse Program Director John McAuliffe, First Assistant Chief Michael Kolakowski, volunteer firefighter and EMT Ben Robedee, volunteer firefighter Cody Schaefer, and Fire Chief Timothy Wolsey. Honeywell’s Emergency Response Team continues to meet with local emergency responders, including those from Baldwinsville, Camillus, Geddes, Liverpool, Solvay, the city of Syracuse, the Onondaga County Department of Emergency Management, and the Onondaga County Department of Emergency Communications 911 Dispatch Center, to prepare for and coordinate emergency response efforts related to the Onondaga Lake cleanup. Substantial progress has been achieved on the Onondaga Lake cleanup, and water quality is the best it has been in decades. Dredging of the lake bottom was completed in 2014, a year ahead of schedule. Capping and habitat restoration will be finished in 2016.